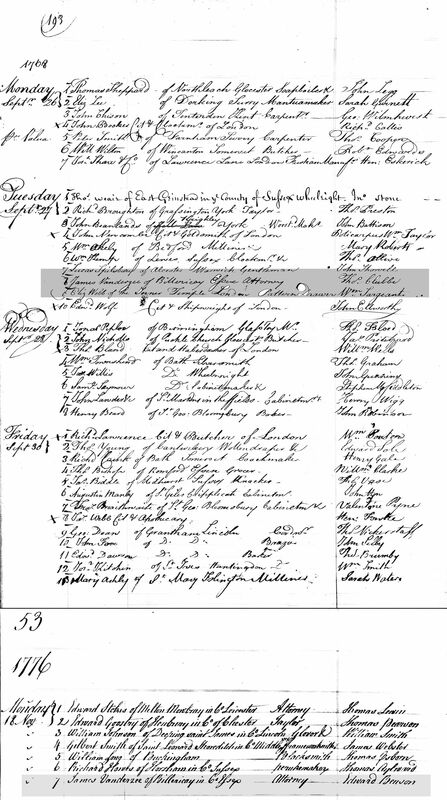 Christened: 19 Jan 1736/37, Nayland Register. Cause of his death was inflammation of the bowels. Admitted 14 Feb 1758 - James Vanderzee of Nayland Gent - Before Judges S Burroughs & Thos Law - Enrolled 13 Feb 1759. James practised as an attorney at Billericay & Rochford ESS, where in the late 18thC he had a large practice demonstrated by his advertising in the London papers of estate disposals, auctions etc. Essex Game Duty - Certificates Issued 25 Mar to 1 Oct 1785 - Vanderzee James of Billericay, gent. Sunday morning died, universally regretted, Mr Vanderzee, attorney at law, Billericay. Chelmsford Chronicle 19 August 1785. To be fold, purfuant to the decree of the High Court of Chancery, dated the 18th day of April 1788, made 1 Greenwood* againft Vanderzee, before Peter Holford Efq., one of the Mafters of the said Court, at his chambers in Symonds-inn, Chancery lane, London. Various houfes in the town of Rochford, in the County of Effex, viz. A houfe late in the refidence of Mr John Wright, deceafed; a houfe at joining occupied by Mr John Gallock, watchmaker; the Marlbro Head Inn, and a large range of wool warehofses adjoining; alfo 2 fields about 10 acres at Little Slambridge, near Rochford, and a cottage and two fields about five acres at Downham; and a Moiety of a cottage and two fields about two acres and an half at Ramfden Bellhoufe, in the faid County; the whole late the eftate of James Vanderzee deceafed. For a particular thereof in choir at the faid Mafters Chambers, and of Mr Benifon, No 19, Lincoln's Inn. Ref: News London Gazette 24 June 1788. To be fold, purfuant to a decree of the High Court of Chancery, before Peter Holford, Efq; one of the Mafters of the faid Court, at his chambers in Symons-inn, Chancery lane, London; in divers lots, three several freehold houfes and a large range of buildings, in the town of Rochford in the County of Effex, in the occupation of Mrs Cope, Mr Gullock, and Mr Newman; and two fields of land at Little Stembridge, near Rochford, in the occupation of Mr John Harriot; and a cottage and garden, and two fields of land, at Downham about 5 miles from Billericay, in the occupation of William Rivers; and a moiety of a cottage, with a garden and two fields, at Ramfden Bell House, about a mile from Downham, in the occupation of . . . . . Bundock, owner of the other moiety. The whole the estate of James Vanderzee, late of Billericay, in the faid County of Effex, Gentleman, deceafed. For a particular of the faid premifes enquire at the faid Mafters Chambers; and of Meffrs Wildman and Smith, Lincoln's Inn. London Gazette March 14 1789 Issue 13077. Purfuant to a Decree of the High Court of Chancery dated the 18th April inftant, made in the Caufe Greenwood againft Vanderzee, the Creditors of James Vanderzee late of Billerica, in the County of Effex, Attorney, deceafed, are forthwith to come in and prove their refpective Debts before Peter Holford, Esq., one of the Mafters of the faid Court, at his Chambers in Symonds-inne, London, or in Default thereof they will be excluded the Benefit of the faid Decree. The Will of James Vanderzee of Billericay Gent. This is the last Will and Testament of me James Vanderzee of Billercay in the County of Essex Gentleman. Ref ESS Nov 579 PROB 11/1136. It appears the Will was inadequately witnessed. All perfons who ftand indebted to the Eftate and Effects of James Vanderzee, late of Billericay, in Effex, gent, deceafed, are defired forthwith to pay their refpective debts to Mrs Vanderzee, of Billericay, aforefaid, his executrix: and It all perfons who have any claims on the faid eftate and effects, are requefted immediately to fend an account of their refpective demands to the faid Mrs Vanderzee. Chelmsford Chronicle Friday, 17 February 1786. Frances Brennan writes in 2012 that James cause of death is recorded in the Death Register of Gt Burstead.